Rachel Maddow connected some dots last night, and anyone wanting to understand the flow of events in Egypt this week should check out her Thursday, 2-3-2011 show, perhaps more than once. What's going on in Cairo is a bit like what went on at Gettysburg. There's a public relations battle layered over the real events on the ground, which are too detailed to really make out from a tenth-floor hotel balcony, filmed with a cell phone. Night before, that's what we got to see: tiny figures ebbing and flowing, little Molotov candles arcing and exploding, little cars on fire, little men on the ground here and there, motionless, the rat-tat-tat of weaponry. And a few vivid snapshots in motion, such as the guy on the camel--which to some American observers such as Glenn Beck, seemed comical and a kind of "proof" that really, "they" were all just crazy little brown people over there. Yesterday thugs stopped all reporting with cameras. Big cheeze American Anchors such as Katie Couric were jostled and shoved. Anderson Cooper was beaten. Two Fox reporters were hospitalized! Brian Williams whispered to us briefly from an undisclosed location. 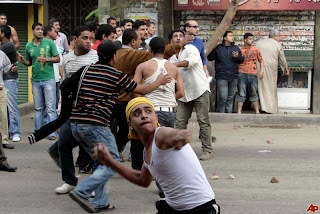 There was general consensus from those being beaten, themselves, that it was Mubarak goons who were doing the beating, just as it was Mubarak goons who attacked the protesters the day before. And Maddow explained why: because (DUH!!!) a crowd of protesters who are nonviolent and feature moments where, for example, women are hugging soldiers, is far more evocative of good PR in the West than arcing Molotov cocktails and burning cars and dead bodies. So how do you change the pictures? Well first you attack the protesters until they respond. And then after there's been plenty of that fresh "mob footage" aired to the world, you beat up the press to shut down the story entirely. If Mubarak is to survive this, the West must be manipulated. The most important fact from our vantage point--that is, of people just peering at the teevee and trying to understand what's happening way off over there--was also reported by Maddow last night--the resignation of Mrs. Amin, Vice-President of the State Egyptian Televison Network. Like most television people, Mrs. Amin could speak very intelligible English. You should hunt up her statement on line--it must be available. She simply says that she cannot participate any longer in the distortion of the news. It's an eloquent statement, and a courageous one. She may pay for it with her life, depending on how events play out. Meanwhile, Fox News is still unwilling to admit that it was Mubarak thugs who were beating reporters, including their own. And while the events in Egypt are of course the primary story of the moment, it really ought to be a national scandal, this Fox Network. While their own reporters are being clubbed and sent to the hospital, they are running Mr. Gingrich's arch opinion that (of course) Mr. Obama is making big mistakes, not to mention Mr. Beck's World Caliphate insanities, and Mr. Hannity's assertions that it's a world-wide communist/islamist conspiracy. In other words, Fox is selling the story that it's this big, violent, radical mob over there, trying to pull down a "democracy" and burning your car in the process, and the secret muslim Obama is in league with them. Fox is like having Pravda in the living room, reporting on Hungary circa 1956. And Limbaugh took the cake yesterday, laughing at the reports of New York Times reporters being beaten, then trying to get serious when he was informed that Fox reporters were also beaten. It was a reinactment of Il Duce's famous remark, which I've mentioned before here (because it strikes me as fundamental to any understanding of the fascist impulse in our political life): "What will you do first, if elected," a reporter asked Mussolini. "Why, kill you," the Great Leader replied. It's beginning to look like Mr. Obama got it very right. No one can say what the final result of this turmoil will be, but America had better be on the side of democracy, and be serious about it. Standing with the thuggery at this point will simply recruit more people to the view that we are pretty much the Great Satan. And of course that's exactly where the Great Satan would stand, isn't it. Excuse me, lemme introduce myself--I'm a man of wealth and taste. and i think nicholas kristof's reporting for the times has been spectacular and brave. i have been following his little mini updates on facebook, getting his observations practically in real time. a journalism hero. I'm a bit embarrassed by all the sympathy that we foreign journos in #Egypt get. Govt is far more brutal to Egyptians. If Mubarak is to survive this, the West must be manipulated. Nonsense. Westerners have no stake in the outcome. But Western leaders must deal with the results. Meanwhile, Obama is obviously siding with Mubarak, rather than the Egyptians he addressed last year in his big Cairo speech. If Obama were siding with the pro-democracy citizens of Egypt, he would send a plane to Egypt and order Mubarak to board it. However, by doing nothing, Obama is sending the message that if Mubarak wants to order his military to attack the rock-throwing citizens, it's okay. Maybe only a small part of the military will respond to such an order. But one tank and its crew are capable of slaughtering thousands in Tahrir Square. On the other hand, the Muslim Brotherhood, which is hoping for its chance to grab power, has plenty of guns. The Brotherhood runs guns to the dirtbags in Gaza. It's beginning to look like Mr. Obama got it very right. Unless the US tell Mubarak to pack his bags. but America had better be on the side of democracy, and be serious about it. Again, how is doing nothing evidence of siding with democracy, and how the heck is waiting on the sidelines an expression of serious purpose? Standing with the thuggery at this point will simply recruit more people to the view that we are pretty much the Great Satan. Because Mubarak is still in charge, the Egyptians know the US is standing with the thuggery. Even our nitwit diplomat Wisner said so. Wisner said the US hopes Mubarak hangs on till some time well into the future. Yeah, Hillary tried to undo the damage, and maybe Wisner will lose his job. But that makes no difference to the Egyptians who see the US doing NOTHING to remove Mubarak from power. That's Obama for you, the Whimp in the White House.